Irakli Alasania is probably the only Georgian politician respected by both the Abkhazian and Ossetian leaders. Alasania, 35, is already an experienced politician. He has global contacts and is well regarded by the Obama administration, which considers him a possible substitute for the problematic Mikheil Saakashvili. In July, 2009, Alasania, former Georgia Ambassador to the United Nations and former Chairman of the Tbilisi-based Abkhazian government-in-exile, founded the political party “Our Georgia – Free Democrats”, as part of the opposition party “Alliance for Georgia”. Alasania is currently running for mayor of Tblisi. The elections, set to take place on May 30, are critical; there is a widespread belief that the winner could potentially become a challenger to succeed Saakashvili as president in 2013. In Tblisi, however, the opposition failed to unite around a single candidate. According to opinion polls, Alasania will have to work hard to win against the incumbent mayor Gigi Ugulava, representative of Saakashvili's United National Movement Party, especially after the recent reforms of the electoral law. 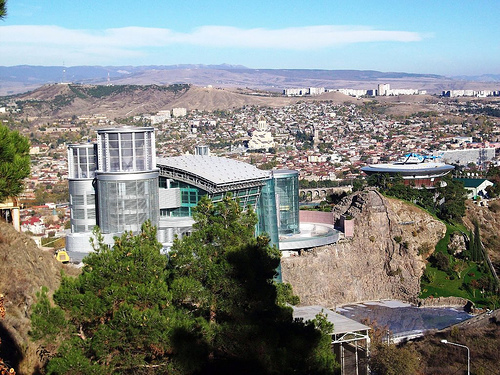 What are your priorities for the city of Tbilisi? The priority is to recover the faith of the people. The political events of the last years have caused nihilism and people don't believe any more that elections can produce any improvement. I'm offering the population of Tbilisi a way to solve the problem of unemployment, have a better health system and, of course, to face Tblisi's main problem: urban development. We want to preserve the uniqueness of the city in collaboration with the experts. Voters in Georgia will elect 64 new municipal councils on May 30, but the major focus will be on the race in Tbilisi where voters will directly elect Tbilisi's mayor for the first time. According to recent changes to the electoral law, a candidate winning most of the votes, but not less than 30 percent, will be declared an outright winner, but a run-off will be required if none of the candidates garners 30 percent. The opposition criticized this provision and fears it will favour the incumbent on May 30. Political parties are also competing for 50 seats on the Tbilisi City Council. 25 seats will be distributed in a proportional contest among the parties which clear the 4 percent threshold. The remaining 25 seats will be contested in Tbilisi’s 25 single-mandate majoritarian constituencies. We must also ensure the people's political rights because Georgia is becoming more and more autocratic. There is overwhelming power in the hands of the president of this country, who controls all the institutions. So these elections are especially important for keeping the balance between the local and the national administrations. Yes. We want to demonstrate in Tbilisi that democratic change is possible in Georgia. Unemployment is high in Georgia. There have been significant improvements, like the general decrease in the level of corruption, but the President of Georgia has started to consolidate his powers. By doing this, Saakashvili weakened the state institutions, a move that would have a strong impact on the development of any country. Currently there is no independent judiciary system and the parliament is not monitoring the law enforcement agencies. Instead, to attract investments, it will be necessary to get the trust of the investors by building strong and balanced institutions. This is also the reason why we haven't been able to develop small and medium-sized business in Georgia: businesses that usually create lot of employment. Would you also change Georgia's approach to Russia? After launching an aggressive war and occupying Georgian territories in the regions of Abkhazia and South Ossetia, our bilateral relations with Russia are at a low point. The growth of antagonism between Russia and Georgia does not help our national interests and aggravates our integration into European structures. We want to start political dialogue with Russia, but not at the expense of our national security interests. We should keep in mind that there are agreements signed by the Russian Federation and Georgia that should be implemented. First of all, this means that the Russian Federation should withdraw his troops from Georgian territory but, as a former diplomat, I understand that this cannot be achieved without talking with the other side. I am a supporter of dialogue and negotiations and I believe that mutual trust could be achieved by opening trade, communications, and dialogue with Russia in order to allow the politicians to talk about political status and political relationship. It will not be easy, we will need time, but there is no other way. If we do not start negotiations with Russia, we will be not able to develop politically or economically. There is a lack of trust between the "de facto" authorities and the government of Georgia, but I am confident in the future. Once in power, our main priority will be to resolve this problem peacefully. We have to demonstrate to Abkhazians and Ossetians that we are sincerely interested in building a relationship without generating a new conflict. There is no military solution to this conflict, and even the aggression of August 2008 has shown that war cannot resolve anything. I am confident that we will come to an agreement for a peaceful coexistence. I negotiated with them and I know that the Abkhazia and Tskhinvali regions would prefer to be part of the European house through Georgia rather than stay under the military occupation of Russia. Both nations, Georgians and Abkhazians, bear the blame for what happened, but we were together in the same state for a long time. We have a common history and a common culture, but in the early Nineties, we didn't want to preserve our friendship. Yes, it was a great political and military mistake of the Georgian leadership at that time to try to restore order by military force, but the provocations and attacks against the Georgian population were also wrong. Since then, we have had a lot of opportunities to rebuild the political dialogue, but we have missed them. We cannot make the same mistake in the future because the future of our nations lies in coexistence. There is no other way; there is no alternative to political dialogue. We have to prepare ourselves for the dialogue through economic trade and infrastructural projects that put people into contact. We have to be patient and have strong political motivation. The breakaway regions of Abkhazia and South Ossetia have a strong argument: if independence was possible for Kosovo, why not for them? First of all, Abkhazia is an historical territory where more than the half of the population - the Georgian population - has been ethnically cleansed. I don't think it is legitimate for one side to dictate which kind of political status the region should have without the participation of the people who were living there before the war. It is unfair and illegal. The integrity of the Georgian territory is recognized by the international community. In Kosovo, there was a process which led to the decision that Kosovo should be independent. In this case, what Russia did through military force in 2008 will be never legitimized. It is a dangerous precedent, not only for Georgia, but also for the whole international order. There are a lot of arguments, both for and against, but we have to find ways to build confidence and then we can negotiate and decide which political status Abkhazia and South Ossetia should have.